After we dropped Frank's Mom off at the airport, we prepared for departure from Antigua to St. Martin. We planned on a 5 AM departure on June 1. We left as planned and started motoring out to the northwest in light winds and calm seas. Did some fishing as we got offshore, and caught some Atlantic Mackerel. They're fun to catch, but we haven't found out if they're good for eating yet, so they all got to go free. After the sun got up, the winds started to pick up and we put up our spinnaker for the first time since we started the trip. It was a beautiful day of sailing downwind with the spinnaker, and we ended up leaving it up all the way into St. Martin. 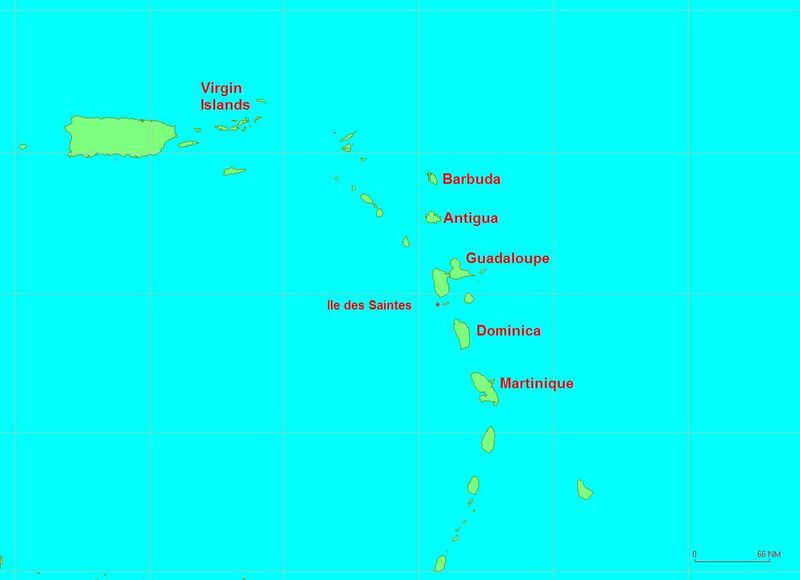 Along the way, we saw Montserrat, Redonda, Nevis, St. Kitts, Saba, and St. Barts. As we passed St. Barts, Frank had several hits and bites on the fishing lines. Two got away, one was so big it snapped the line. But, then, he finally brought a nice 15 pound Blackfin Tuna! That was fun! There must have been a large school of them in the area, as we covered several miles while the hits occurred. We arrived before sunset in St. Martin. The first thing we did is drop the dinghy and went ashore to check on the movies. St. Martin is the only place we had found with a really nice movie theater and movies in English. Sure enough, "Matrix Reloaded" was showing. Since it was "R" rated, Karen and Frank went to watch it. The girls went to see "Bruce Almighty". Karen and Frank were a bit disappointed in the plot of "Matrix Reloaded", but were still entertained - especially since it had been so long since we had seen a movie. The girls loved "Bruce Almighty". The next couple of days we spent inside the lagoon and ran lots of errands. We needed to shop for boat supplies, get on the Internet, grocery shopping, and to go downtown and buy new walkie talkies. All of those things were accomplished, and each night we went to the movies! We had a US Coast Guard helicopter come fly over us when we were about half way. They hailed us on the radio and just asked for general info as they were on a scouting mission. We had a school of False Killer Whales visit us 12 miles to the southeast of Virgin Gorda. They caught our attention with their squeals right under our hulls. We ran up and saw what first looked like a large dolphin. But, upon closer looks we saw they had blunt whale-shaped heads. They seemed quite playful and swam off our bows. Then a bunch swam in the wake of just our port hull. Frank was looking at them up close, and suddenly noticed we had a long thin peice of net caught on either our rudder or the propellor (which wasn't on since we were sailing). We decided the whales purposely pointed this out for us. Later Frank dove off and removed it before we started the engine - it was on the prop. Frank only caught one fish - a Barracuda off Peter Island - and threw it back. Lost the net in the process. Oops. Arrived in Leinster Bay, St. John at 5:45 and had a relaxing evening. Went to St. Thomas and had ice cream at Cold Stone - Yummy! Went to the mall and did some shopping. The main treats: the girls got some jewelry at Claire's, and we got some DVD movies! Visited Hemmingway's - a nice little bookstore which caters to sailors. The woman also helps the humane society and again had kittens. The girls love this place. We stayed an extra day - on Sunday - to visit with Hotel California one more time. We went out to dinner that night at Jolly Roger and had a great time visiting with them. On Monday, June 9th, we ran some final errands and said our goodbyes to HC and then left about 11:15 AM. We had a "short" four hour sail to Culebrita ahead of us. It was a very nice day for a sail, and was largely uneventful. We hooked a really nice looking, hard fighting fish. Frank thinks it was a Wahoo. Unfortunately, in its several jumps into the air it managed to get loose. At least we didn't lose the lure. It was fun anyway. We arrived to Culebrita at about 3:00. Culebrita is a small island near Culebra in the Spanish Virgin Islands. Culebrita is a US National Wildlife Refuge and has no buildings except for a lighthouse on the tallest hill. The bay on the north side is really beautiful with a classic curved white sand beach. The beach is pristine white and pink sand with almost no shells or rocks. So, it is soft as can be. Catherine and Frank were the explorers this time. They took the kayak ashore and then walked the one marked trail we found on the island. They went to a beach on the Atlantic side, and a beach on the south side facing Culebra. Very beautiful. The main wildlife are lizards, hermit crabs, and birds. We spent another day in Culebrita and thoroughly enjoyed it. Frank and Karen went snorkeling and the conditions were excellent. We saw two real deer on the beach in the early morning hours. That was a surprise, we were wondering how they got here. On Wednesday, June 11, we departed Culebrita and tried to sail to San Juan, Puerto Rico. We say "tried" only because the winds were a bit on the light side, so we ended up motoring about half the time. We raised the spinnaker three times when the winds got high enough. It was an 8 hour trip to San Juan. We had a couple of rain showers along the way, and a big rainshower crossed San Juan just as we arrived to the port. A cruise ship came out of the port just before we entered. Then we motored our way into the port and around Old San Juan to the marina Karen and Frank had gone to when they first delivered the boat back in early 2002. We got a slip in the marina and after clearing with customs over the phone, we all took showers and went for dinner at Sizzler Steakhouse (just like in the States). It was good to have an American-style meal, even if most of the people there only spoke Spanish. We plan to do a few days of sightseeing here in Puerto Rico. And then, when the weather is good, begin the long passage through the Bahamas. We'll await good weather again to cross the Gulf Stream from West End, Grand Bahamas. We'll sail to St. Augustine, Florida and visit with some friends. Then, we'll make our way up the coast to Beaufort, NC and be home by the end of June.